Hotch & 모건. . Wallpaper and background images in the SSA Aaron Hotchner club tagged: criminal minds aaron hotchner derek morgan season 4. This SSA Aaron Hotchner fan art contains 신사복 and 비즈니스 정장. There might also be 드레스 정장, 전체 드레스, 연미복, 테일 코트, 꼬리, 흰색 넥타이, 흰색 넥타이와 꼬리, 드레스 복, 정장, 꼬리 코트, 흰 넥타이, 흰 넥타이 및 꼬리, 드레스 한 벌, 풀 드레스, tailcoat, 화이트 타이, 화이트 넥타이 꼬리, 옷 한 벌, 한 벌, 옷, 양복, and 정장. Hotch: Quantico’s requested you transfer to run the New York office. Morgan: Hotch, they haven’t even buried her yet. Hotch: We’re at war. Things change. Morgan: Don’t I need you recommendation? You didn’t give it, did you? 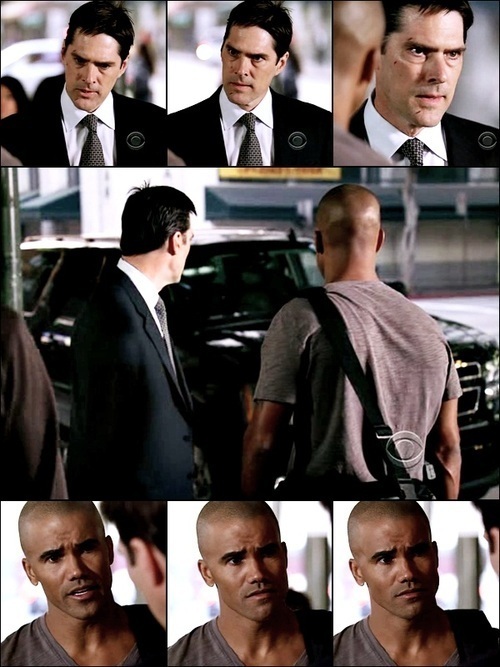 Hotch: Your actions, as incredibly brave as they were… would still be action of an agent who doesn’t truly trust anyone. Morgan: Hotch, I did it for this team. Hotch: My opinion doesn’t matter. Job’s yours if you want it. Morgan: Hotch. Your opinion matters to me. Hotch: My life matters to me, and I have and always will entrust you with it. Would you do the same for me? Still want to drive?